My Scripts Repository: State Holidays & Importing Into Outlook. 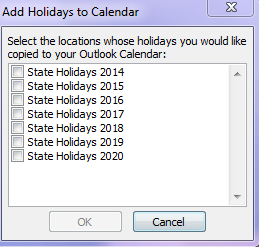 State Holidays & Importing Into Outlook. The other day, I started planning out vacations for the next year and realized I didn't have updated holidays in my calendar. My office provides us the same days off as the State of California, so I used their rules when creating this script. The following Monday shall be observed as the holiday for any holiday which falls on a Sunday. *Holiday credit is accrued if any of these dates occur on a Saturday. **For Veteran’s Day, the preceding Friday shall be observed as the holiday on years when November 11 falls on a Saturday. Running this script will generate output the 11 State holidays for the year that you specify when running the script. I then feed that into a simple write-host that formats the data into the HOL file format. Open Notepad, create header, then copy and paste the script info. Repeat for all years you want the data. Double-click the file and click the categories you want to import. Will generate dates suitable for creating Holiday file to import into Outlook. Year want to find holiday's on. #$FindMonday will find offset to first monday in Month. $FindMonday["Sunday"] will return 1. #Same as FindMonday, but biased for Thursday. Only used for US-Thanksgiving date. $Holiday = "New Years Day"
$Holiday = "Martin Luther King Jr."
#Find 3rd Monday in Month. First Monday + 2 weeks. $Holiday = "Cesar Chavez Day"
$Holiday = "Vetern's Day" # Always celebrate holiday, Saturday falls to Friday, Sunday goes to Monday. #Find 4th Thursday in November. $Holiday = "Day After Thanksgiving"   #No working on Black Friday.